Douglas Spain (born April 15, 1974) is an American film and television actor, director and producer. In 1998 Spain was nominated for an Independent Spirit Award in the category of Best Debut Performance for his role in the film Star Maps. In 1999 he won the Rising Star Award at the Marco Island Film Festival for The Last Best Sunday  and in 2006 he won the Camie award at the Character and Morality in Entertainment Awards for his part in The Reading Room . He has since appeared in various features, including Permanent Midnight , But I'm a Cheerleader , A Time for Dancing , What's Cooking? , Cherry Falls , Delivering Milo and Still Green . The Reading Room is a 2005 television film that originally premiered on Hallmark Channel. It was directed by Georg Stanford Brown. Permanent Midnight is a 1998 independent drama film directed by David Veloz and starring Ben Stiller. The supporting cast features Maria Bello, Elizabeth Hurley, Owen Wilson, Cheryl Ladd and Janeane Garofalo. But I'm a Cheerleader is a 1999 American satirical romantic comedy film directed by Jamie Babbit and written by Brian Wayne Peterson. Natasha Lyonne stars as Megan Bloomfield, a high school cheerleader whose parents send her to a residential inpatient conversion therapy camp to cure her lesbianism. There Megan soon comes to embrace her sexual orientation, despite the therapy, and falls in love. The supporting cast includes Melanie Lynskey, Dante Basco, Eddie Cibrian, Clea DuVall, Cathy Moriarty, Katrina Phillips, RuPaul, Richard Moll, Mink Stole, Kip Pardue, Michelle Williams, and Bud Cort. On television, Spain appeared in the Emmy Award-winning Band of Brothers , and has made guest appearances on Star Trek: Voyager , Pacific Blue , Nash Bridges , Brooklyn South , Becker , The Practice , JAG , Family Law , CSI: Miami , The Mentalist , NCIS , and House M.D. He has directed the films Charity , Online , Crazy , Crazy Too and The Monster . Star Trek: Voyager is an American science fiction television series created by Rick Berman, Michael Piller, and Jeri Taylor. It originally aired between January 16, 1995 and May 23, 2001 on UPN, lasting for 172 episodes over seven seasons. The fifth series in the Star Trek franchise, it served as the fourth sequel to Star Trek: The Original Series. Set in the 24th century, when Earth is part of a United Federation of Planets, it follows the adventures of the Starfleet vessel USS Voyager, as it attempts to return home after being stranded in the Delta Quadrant on the far side of the Milky Way galaxy. Riot is a 1997 American television film starring Luke Perry and Mario Van Peebles. It was written and directed by four writers and directors of four different racial groups prominent in Los Angeles. The title "Riot" refers to the Los Angeles riots of 1992 that were sparked by the beating of Rodney King, and the subsequent acquittal of the four police officers who beat him. 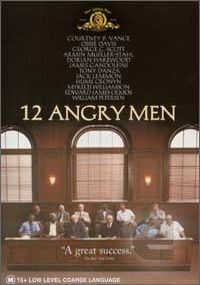 12 Angry Men is a 1997 American made-for-television drama film directed by William Friedkin, adapted by Reginald Rose from his original teleplay of the same title. It is a remake of the 1957 film. Star Maps is a 1997 American drama film co-written and directed by Miguel Arteta and starring Douglas Spain. The film is the directorial debut of Miguel Arteta, and it was first presented at the Sundance Film Festival. It was a critical hit, receiving five Independent Spirit Award nominations, including Best First Feature and Best First Screenplay. Jan Tomáš "Miloš" Forman was a Czech American film director, screenwriter, actor and professor who, until 1968, lived and worked primarily in the former Czechoslovakia. Joseph Alberic Twisleton-Wykeham-Fiennes, known as Joseph Fiennes, is an English film and stage actor. Devon Gummersall is an American actor, writer, and television and film director best known for his role as Brian Krakow on ABC's My So-Called Life. Dame Penelope Anne Constance Keith, is an English actress, active in all genres, including radio, stage, television and film and primarily known for her roles in the British sitcoms The Good Life and To the Manor Born. She succeeded Lord Olivier as president of the Actors' Benevolent Fund after his death in 1989, and was appointed Dame Commander of the Order of the British Empire (DBE) in the 2014 New Year Honours for services to the arts and to charity. Javier Ángel Encinas Bardem is a Spanish actor. Bardem won the Academy Award for Best Supporting Actor for his role as the psychopathic assassin Anton Chigurh in the 2007 Coen Brothers film No Country for Old Men. He has also received critical acclaim for roles in films such as Jamón, jamón, Carne trémula, Vicky Cristina Barcelona, Boca a boca, Los lunes al sol, Mar adentro, and Skyfall, for which he received both a BAFTA and a SAG nomination for Best Supporting Actor. 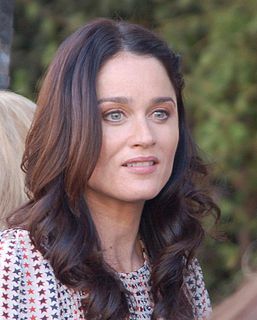 Robin Tunney is an American actress. She is known for her role as Teresa Lisbon on the television series The Mentalist (2008–15), and her portrayal of Veronica Donovan on the first two seasons of Prison Break (2005–06). Maurice Alberto Rocca is an American humorist, journalist and actor. He is a correspondent for CBS Sunday Morning, the host and creator of My Grandmother's Ravioli on the Cooking Channel, and also the host of The Henry Ford's Innovation Nation on CBS. He is the moderator of the National Geographic Society's National Geographic Bee. He is the host of the podcast Mobituaries with Mo Rocca from CBS News. Kristy Wu is an American actress, best known for her recurring role as Chao-Ahn in the TV series, Buffy the Vampire Slayer and co-starring as Melissa Wu in Flight 29 Down. Other television credits include guest appearances on Joan of Arcadia, Freaks and Geeks, and Moesha. Her movie appearances include What's Cooking?, Drive Me Crazy, and Cry Wolf. She also co-starred alongside Sara Paxton as one of the Sinister Sisters in the fourth installment in the Disney Channel film series Return to Halloweentown. Richard Gilliland is an American television and movie actor. Poj Arnon is a Thai film director. He is best known for his 2007 film Bangkok Love Story that won him the Grand Prize at the Brussels International Independent Film Festival. Gerald William Trainor is an American actor, comedian and musician. He is known for his roles in the Nickelodeon shows Drake & Josh, iCarly, and T.U.F.F. Puppy. The Mentalist is an American drama television series that ran from September 23, 2008, until February 18, 2015, broadcasting 151 episodes over seven seasons, on CBS. Created by Bruno Heller, who was also its executive producer, the show follows former "psychic" Patrick Jane, who is a consultant to the California Bureau of Investigation (CBI), using the highly developed observational skills he previously employed to "read" people's minds. Hartmut Becker is a German actor. He played Sgt. Gustav Wagner (1911–1980) in Escape From Sobibor in 1987. He also starred in the 1970 film o.k, which was also entered into the 20th Berlin International Film Festival. However, the competition was cancelled and no prizes were awarded, over controversy surrounding the film. After O.K. Hartmut Becker was one of Germany’s busiest actors in film and theatre. More important main parts in films followed like in Verhoeven’s „Who Love in the Glasshouse“, „Als Mutter streikte“, „John Ralling“ (TV), „Mitgift“, „Audienz“ (TV), „Sonntagskinder“. His first leading part in an English language production Mr. Becker performed in the BBC-film „Forgive our foolish ways“, where he played the role of a German prisoner of war next to Kate Nelligan. The television film became a very big success all over the world. Hartmut’s following international film was the American-English production „Jenny’s War“ where he portrayed the main part of Karl Koenig, a character in the crucial test between love and war. His partners in this film where Dyan Cannon, Elke Sommer and Trevor Howard. For his widely praised performance in the following American production „Escape from Sobibor“ Hartmut had been nominated for an Emmy Award 1988. In his next ‚Festival-Film‘ Hartmut Becker worked together with admirable director Lina Wertmüller. His female partner in this feature film was Dominique Sanda. Several dream parts followed after the success of „Il decimo clandestino“, for example the characters Niels Jost in „A quiet conspiracy“, Rauscher in the American Film „Triumph of the Spirit“, Lutz in the English-French Television Film „Free Frenchmen“, Moritz in the English-Austrian feature film „Gavre Princip“ by Peter Patzak, King Christian in „Young Catherine“, Rusty in the Italian TV-film „Requiem per Voce e Pianoforte“, and last not least Dieter Krause in the English TV-thriller „The Waiting Time“. His last leading in a German feature films of the last years were „The Unforgotten“, "Montag kommen die Fenster"/"Windows will drive on Monday", "The Gift" and "Amatores Meae Matris". Between 2007 and 2012 Hartmut Becker was a member in the committee of the German Academy of Film. As a songwriter and singer his first single was produced in 2013. Arnold Kopelson was an American film producer. Kevin Dowling is an American film, television director and producer. ↑ "Official Site of Douglas Spain". Archived from the original on July 8, 2007. Retrieved July 11, 2007. ↑ "About the Filmmakers". Charity Press Kit. Archived from the original on February 10, 2006. Retrieved March 18, 2010. ↑ Gieseke, Winston. "Douglas Spain Becomes the Change He Wants To See". The Advocate, 1/27/12. Archived from the original on 2012-01-29.